When people hear the acronym, PTSD, most think immediately of veterans and their mental health subsequent to fighting in war. And it’s true—many veterans come back from the front having undergone traumatic experiences and seen disturbing sights that can cause varying degrees of mental illness. This is a huge issue in the military, and it is important that we all recognize that. 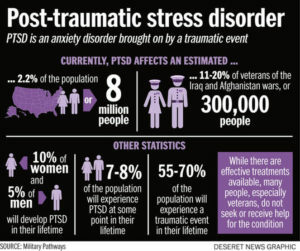 However, PTSD is an issue that affects a huge number of people—and not exclusively veterans. Post traumatic stress disorder is “a psychiatric disorder that can occur following the experience or witnessing of…life-threatening events such as military combat, natural disasters, terrorist incidents, serious accidents, or physical or sexual assault in adult or childhood” (ptsd.ne.gov). There are many instances after which PTSD can occur that include but are not limited to the examples given above. PTSD occurs when the prefrontal cortex, amygdala, and hippocampus do not work together properly. Normally, these three parts of the brain function together due to the nerve circuits that connect them. However, in an instance of PTSD, these circuits are often damaged (http://dcoe.mil). Thus, the brain is not able to cope with the issue at hand—an issue which can be an obstacle for days, months, or even years after the original event occurs. PTSD is an issue which most people know a bit about but which is not a hot topic in the everyday life of a college student. Presumably, due to the stereotype that PTSD is solely a military issue, people do not acknowledge it as a disorder that affects many people around them. About 24.4 million Americans struggle with post traumatic stress disorder today, and chances are many of us know someone affected, if we are not one ourselves (ptsdunited.org). It is unbelievable, in my opinion, how much air time we give to political and economic issues when social issues, such as mental health, are rarely topics of discussion. People withdraw from situations and discussions regarding mental health, particularly if they are unfamiliar with mental illness or are unaffected by it. We need to change this. On college campuses PTSD is more prevalent than many people know. In fact one in every nine women develops PTSD in her lifetime, and many of those women develop this disorder as a result of sexual assault (ptsdunited.org). Of course, it is indisputable that sexual assault is all too common on college campuses—with that in mind, also common is PTSD. The conversation surrounding sexual assault and misconduct is limited. F&M has hosted events such as the “Forum on Sexual Misconduct” during which students have asked questions about the actions taken and policies surrounding sexual assault. The college has also made some effort to educated first-years during orientation about sexual abuse and healthy relationships. However, the conversations always seem to end there. Never do we talk about the mental state of those affected by sexual assault. We do not discuss coping mechanisms or have a solid support system in order—at least none that I know of, and I think just that says something. Sometimes it is about more than the incident, more than the outcome of the persecutor, more than the trial. Sometimes what is deserving of the most of our attention is the period after all of this is over—when the victim is often still affected more than anyone knows. If you cannot think of someone affected by PTSD, you can at least think of someone affected by sexual violence. That person has, likely, undergone much mental stress and possibly has or has had some form of post traumatic stress disorder. But do we notice that? Not usually. Many people are private about experiences that they have undergone and about mental illnesses in general, but these people need to know that there is some action being taken to improve communication on campus about these issues—whether that is done by hosting didactic forums, putting support groups in place, or holding a protest of some sort. We are better than this. What are we going to do? The purpose of this article is not to explain why PTSD due to sexual assault is more significant than military related PTSD, or any other form of the illness for that matter. It is purely to explain that many of the people that we know and love on this campus are currently experiencing cases of PTSD—the majority of which, at our age, on our campus, are due to sexual assault. However, whatever the cause is, PTSD is a major issue and is, therefore, deserving of attention. Victims of traumatic situations should not feel the need to hide or keep their experiences to themselves if they do not want to. We need to ensure that the community at F&M is a respectful and welcoming space for people to share problems that they have or situations that they have undergone. I think the only way to do that is to open up the conversation surrounding mental illness and eliminate the stigma that seems to therein lie. After all, we are at college to learn and to grow. In order to do so, we all must feel as though we are heard. Sophomore Alex Pinsk is the Opinion and Editorials Editor. Her email is mpinsk@fandm.edu.